I am taking in deep, deep breaths. I had quite a scare last week. As you might remember, I have been dealing with a pinched nerve since February. I had 2 months of physical therapy, high dosages of prednisone, doses of gabopentin, and an epidural. Nothing was working at all. My leg is getting weaker and achier every day. I can hardly climb stairs right now. 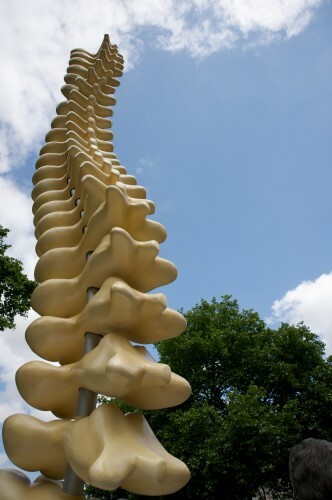 So last Thursday I went to see a new spine specialist. He was someone my wonderful physical therapist, Mandy recommended. He was very nice and very thorough. He went through the whole MRI with me section by section. He examined me thoroughly. To him, the weirdest thing about the disc was that it looked like it had broken off in there. And all my other discs looked, well, so perfectly lovely to him. However, that would explain why 2 months of physical therapy wasn’t working. Then at the end, he showed me the paper report from that last MRI. It strongly suggested having another MRI with contrast dye to see if in fact it really was a ruptured disc or might be something called a “nerve sheath tumor”. Of course as soon as I heard the word tumor and spine in the same sentence, I began my descent into what can only be described as madness and depression. This is it, I thought. I am going to die. What else could I think? Then the waiting began. For a week, I waited, and stressed. I finally had the MRI yesterday and haven’t left my house or the phone for the entire time. Waiting, waiting, waiting for the doctor to call. During the week of waiting for the appointment and then the call here is what I did. Cried, slept, watched multiple Star Trek movies (I am not a Star Trek fan but it was all that was on). Cried more. Had multiple panic attacks where I couldn’t eat or breathe. Those were the worst. I felt like I was swimming in Jell-O. It got so bad, I couldn’t leave the house. I never knew when or where the panic attack was going to strike. I would see a young mother and be reminded of my youth and being a young mother myself. That alone was enough to send me into a tailspin. I would cry just thinking of my husband and all our plans for retirement and our future together. The slightest thing would set me reeling. My primary care doctor called about an hour ago to tell me I don’t have a tumor, that it looks like the disc did in fact break off. He said the surgeon would tell me more, but that in the meantime he wanted me to stop worrying about the diagnosis. He is so sweet, my primary. I lucked out in the primary care department. So now I will wait to speak to the surgeon. I am quite sure I will need surgery to remove the piece of disc in there but suddenly surgery for something mechanical doesn’t seem so bad does it? Oh and please, do me a favor, no horror stories about back surgery. I couldn’t handle that right now. It seems everyone knows someone or had surgery that didn’t work etc. But just don’t tell me about that OK? Deal? Thanks. I need to think positively now going forward since I have already flooded my poor body with too many negative thoughts this week. Enough for a lifetime. Oh my Roberta, how horrible for you. But how awesome it's not cancer. You'll be right as rain when it's all said and done!! Take care! Oh, Roberta. I know exactly what you were going through, and I'm so sorry you had to go through it -- but so relieved that it's not cancer. Good story, not bad.... I had back surgery February 8th this year and now have no pain, no weakness in my legs and feel really good and I do feel like a new woman. The recovery was good and I'm moving along really well with physio. Best wishes and message me at any time if you wish. Phew! What a scare and what a relief it's not the big C. It sounds like an awful week. I hope that relief from back pain is in sight, even if it means surgery. It must be helpful to know there's a reason why the physical therapy wasn't working. All good thoughts to you my friend. It's time for a pain free summer! Hi Roberta. I'm so sorry you are going through this. Isn't it amazing how people love to tell you their own medical experiences!! I'm telling you...when I was really young, my doctor told my parents I should have my tonsils out. My older sister scared me and told me they were going to shave me...you know...where they didn't need to. Scared me so bad I refused to have them out and suffered many times with strep. Did that give you at least a smile??? What I learned from that when I got older is to never pay attention to bad medical experience stories. You'll be just fine. Back surgery today is not what it was even 10 years ago. I'm so sorry to hear about your health challenges. Wonderful news that it's not cancer. After just going through cancer surgery with both my Mom (gastric) and my best friend (esophageal), it is a very scary diagnosis. I hope all goes well for you in your treatment and recovery. My brother had a very similar issue with his back 2 years ago (a couple of small pieces of bone broke off). He had surgery and is now healthy and biking 20 miles a day. Sending you good thoughts and prayers! What a scary thing to go through, Roberta. Thinking of you. I'm very glad for the way it turned out! The rest is do-able! I'm so happy for you, Roberta. Waiting is the absolute worse; I have done that and been in a deep depression. I don't know how some people are able to kind of not dwell on those things and thing positively. Not me, I'm like you.